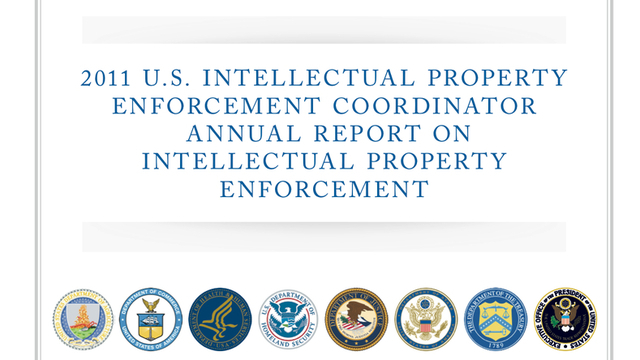 The White House's Annual Report on Intellectual Property Enforcement is out, and there are some encouraging words in the 130-page document. The policy compendium reiterates what the Obama Administration declared in mid-January when pressed to take a position on the Stop Online Privacy Act. Back then, the White House announced itself a SOPA skeptic. Apparently, it still is. "Online piracy is a serious problem," says US Intellectual Property Enforcement Coordinator Victoria A. Espinel, but the administration "will not support legislation that reduces freedom of expression, increases cybersecurity risk (including authority to tamper with the DNS system), or undermines the dynamic, innovative global Internet." And the Annual Report emphasizes the importance of openness in making IP policy decisions. "The IPEC continues to encourage improved transparency in intellectual property policy making," the survey insists. The Coordinator maintains an "open door" policy, and consults with "hundreds of stakeholders, large and small, across a broad range of sectors in developing and implementing the Administration's strategy for intellectual property enforcement." This is a refreshing statement, if the US really means it. We didn't see a lot of that open door spirit in recent negotiations over the Trans-Pacific Partnership (TPP). It's a multilateral deal that would extend Digital Millennium Copyright Act dogma on digital lock rules and subscriber disconnection policy to a dozen or so countries in South East Asia. Recent talks on the agreement, held at a West Hollywood hotel, were so hush-hush that opponents of the deal couldn't even book a "public interest briefing" at the venue. "We have a confidential group in house and we will not be allowing any other groups in the meeting space that day," a hotel attendant told them. The document also celebrates another controversial trend in IP enforcement policy—basically letting Hollywood, ISPs, credit card companies, and advertisers define the parameters of copyright via "voluntary" agreements. The IPEC continues to facilitate and encourage dialogue among the different private sector entities that make the Internet function. As an Administration, we have adopted the approach of encouraging the private sector (including ISPs, credit card companies, and online advertisers) to reach cooperative voluntary agreements to reduce infringement that are practical, effective, and consistent with protecting the legitimate uses of the Internet and our commitment to principles of due process, free speech, fair use, and privacy. Rightholders are an excellent resource for information regarding their own products and it is important that the Federal government and rightholders work together to more efficiently protect intellectual property rights. Obtaining the assistance of rightholders to help determine whether goods are infringing is critical. The IPEC will continue to support and encourage communication and information sharing efforts between enforcement agencies and rightholders. Despite the "protecting legitimate use" language cited above, critics worry about this strategy for copyright enforcement. "We remain extremely wary," reacts Public Knowledge's John Bergmayer to the document, "of the reliance the report places on information regarding copyright industries as a source of information regarding infringement. Particularly in cases involving fair use, rights holders have not shown themselves to be reliable judges of infringement." However you view the development, the Annual Report lists the most important of the aforementioned voluntary agreements. These include a June 2011 deal among the major credit card companies to come up with "best practices" for the withdrawal of payment services for sites that sell counterfeit goods. A month later, the US's major ISPs announced a "six strikes" copyright enforcement plan. It involves four relatively innocuous "alerts" sent to broadband subscribers who appear to be engaging in illegal downloading. It's only until the fifth alert that "mitigation measures" kick in, among them a temporary reduction in Internet speeds or a browser page redirection that won't stop until the subscriber agrees to a little chat with the ISP. In December of 2010, a slew of companies, among them American Express, MasterCard, Microsoft, and PayPal, announced the launching of a non-profit to fight phony pharmacies—"criminals masquerading as legitimate pharmacies," in the government's words. Ironically, Uncle Sam remains a prominent customer for knock off goods. About four years ago a leaked Federal Bureau of Investigation presentation revealed how concerned the agency had become about the situation. The Power Point slides reported fraudsters selling routers, switches, interface converters, and WAN interface cards to the federal government at fire sale prices. Example: $1,375.00 for a legit router, $234.00 for a counterfeit. Buyers of this fake gear included the US Naval Academy, the Naval Air Warfare Center, the Naval Undersea Warfare Academy, an air base in Germany, the General Services Administration, the Air Force, the Federal Aviation Administration, top defense contractor Raytheon, and the FBI itself. And it looks like the problem still hasn't gone away: "As the purchaser of over $500 billion in goods and services per year," the latest IP report observes, "the US Government must ensure that it does not purchase counterfeit goods, secure its supply chain, and take the necessary steps to combat the evolving tactics of counterfeiters." The White House is now engaged in developing a "government-wide strategy" to address the problem. "The strategy will focus on reducing the risk of counterfeit items entering the supply chain, dealing efficiently with any suspected counterfeit items that do enter the supply chain, and strengthening remedies against those who provide counterfeit items to the US Government," the section concludes.